35 years ago tonight (1979): Helmet-Gate. Before a 5-1 win over Atlanta, the Flames complained that Isles goalie Billy Smith was wearing a white helmet while the rest of the team was wearing blue. Since Smith did not have a blue helmet readily available, the Isles wore white helmets and then pounded Atlanta. 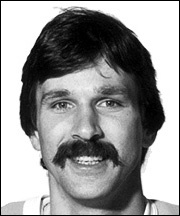 Rookie Yvon Vautour scored the game-winning goal in his first NHL game– it was the first of three goals he would score in an Islander uniform. 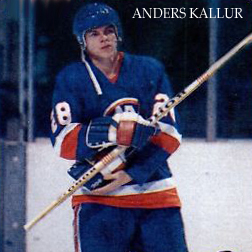 Anders Kallur, an important piece of the Dynasty era (and now a scout for the New York Rangers), made his NHL debut as the Isles scrambled their lineup following a series of injuries left Denis Potvin, Bobby Nystrom and Bob Bourne all out of the lineup. Also on this date: (2010) - Milan Jurcina scored his first two goals as an Islander in a 4:55 span of the second period to break a scoreless tie as the Isles defeated Colorado 5-2. All-time, the Isles have played ten October 16th games at the Coliseum and have compiled a 6-1-3 record on this date at 1255 Hempstead Turnpike in Uniondale. The eleventh and final October 16th home game is tonight –as the Isles host San Jose at 7:00. Make sure you’re there, because after tonight, there are only 39 regular season games remaining.